hi hardhackers! hardhack proudly presents an awesomesauce workshop coming up very soon: Manuel Odendahl will conduct an Arduino paper automaton workshop which requires prior registration here. 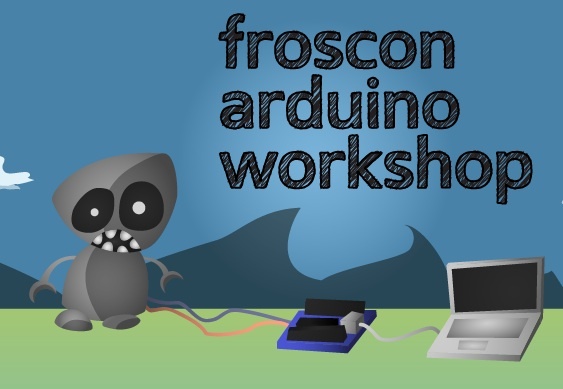 It will be held in the hardhack track at FrOSCon on Saturday, August 21st starting at 10:00 am in room C117 (link to workshop in FrOSCon schedule here). FrOSCon is located in Sankt Augustin, outside of Bonn and near Cologne in Germany. a snippet from Manuel’s description of the hands-on workshop: “We will build a paper automaton, animate it with servos connected an arduino, and control it using processing. We first begin by cutting small mechanisms out of paper, glueing them together, coloring them. In a second step, we program an arduino and connect it to servos to animate the paper automaton. In a third step, we control the arduino through processing, making the automaton move according to music or other user inputs. So get over to his registration page, and come join us for another installment of hardhack replete with makerbots, lots of arduino action, big blinky led installations, fnordlichts, and much moar hands-on action!